Be it SSC CGL Tier-1 or Tier-2, Trigonometry always plays an important role in Quantitative Aptitude section. If you are going to face Tier-2 Exam, you will face 8-10 questions or even more from this section. In trigonometry, one question is always asked where they give you some trigonometric expressions and ask you to find their minimum or maximum value. Normally, students calculate it by using the range of different trigonometric functions which can be time consuming( considering the fact that you get only 2 minutes for solving each question in tier-2). Today, i am providing you the list of formulae using which you can solve these questions within seconds. 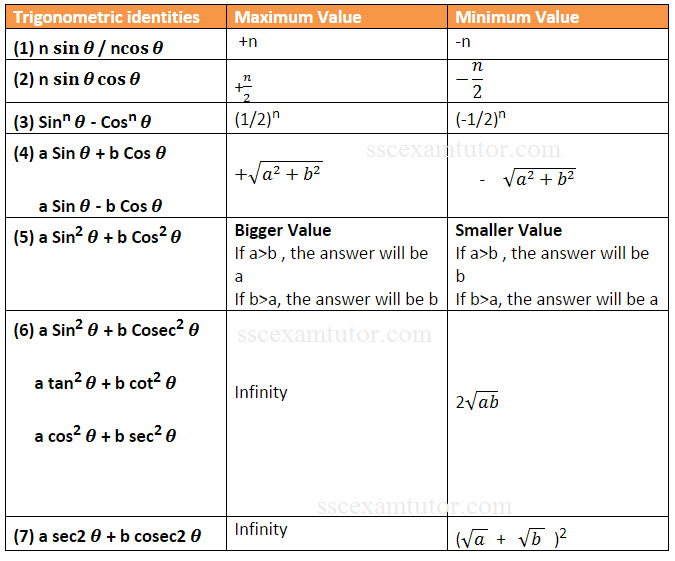 Check below given formulae and use them while solving questions related to maximum/ minimum value. Let me know, if you have any doubt or confusion.